Designed to prevent premature wear of Sander Backup Pads! Sacrificial pads with H&L on one side and Grip on the other. Place between sander's backup pad and Abranet Sanding Discs. Prevents wearing of H&L face on more expensive sander backup pads. Easily replaceable and low cost. Helps to improve collection airflow through Abranet mesh. Original 5" Diameter Mirka CEROS sanders used a 5" x 5 Hole pattern pad. Mirka 5" DEROS & more recent 5" Mirka CEROS sanders use a 5" x 8 Hole pattern pad. Mirka 6" CEROS & DEROS sanders used the 6" x 6 Hole pattern. Please check your sander to confirm the proper hole pattern prior to ordering. 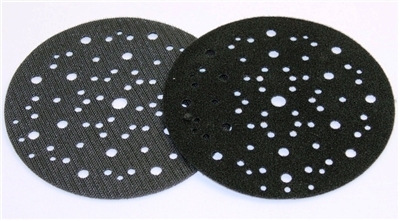 The 5" x 8 Hole pad protectors fit many other brands of sanders...use them to extend life of those backup pads as well.